Background: Bacopa monnieri (BM) is a herbaceous plant traditionally used from time immemorial in Ayurvedic and folklore medicines. We hypothesized that the extract of the whole plant might contain numerous molecules with having antitumor activities that could be very effective in killing of human cancer cells. Objectives: This work investigated anticancer activity of bioactive fraction of BM. Materials and Methods: The hydroalcoholic extract of BM was fractionated with different solvent, namely, hexane, dichloromethane (DCM), acetone, methanol, and water. The in vitro anticancer activity was performed against various Human Cancer Cell lines, namely, Colon (HT29, Colo320, and Caco2), Lung (A549), Cervix (HeLa, SiHa), and Breast (MCF-7, MDAMB-231). Further, DCM fraction was evaluated in vivo for anticancer activity against Ehrlich ascites carcinoma (EAC) tumor-bearing mice since it showed the best cytotoxicity at 72 h (IC5041.0–60.0 μg/mL). 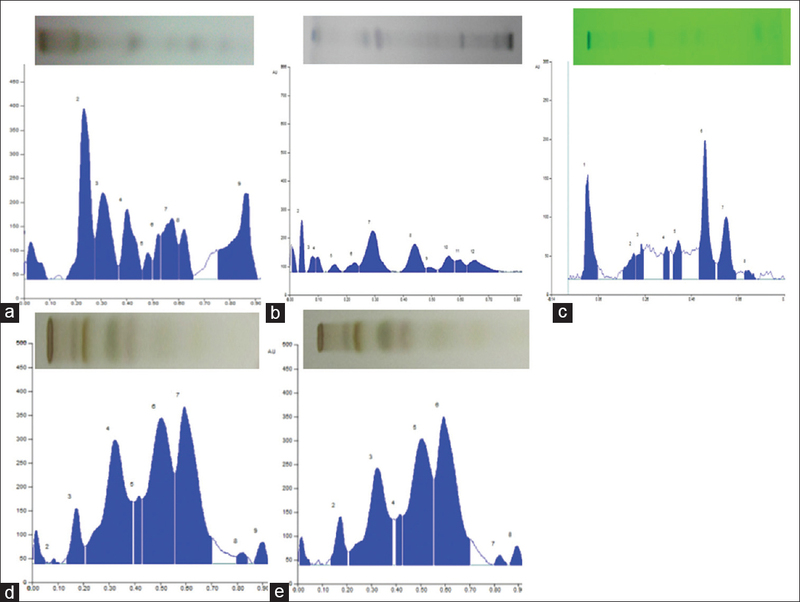 The metabolic fingerprinting of these extract were carried out using high-performance thin-layer chromatography along with quantification of bacoside A, bacoside B, cucurbitacin B, cucurbitacin E, and bittulinic acid. 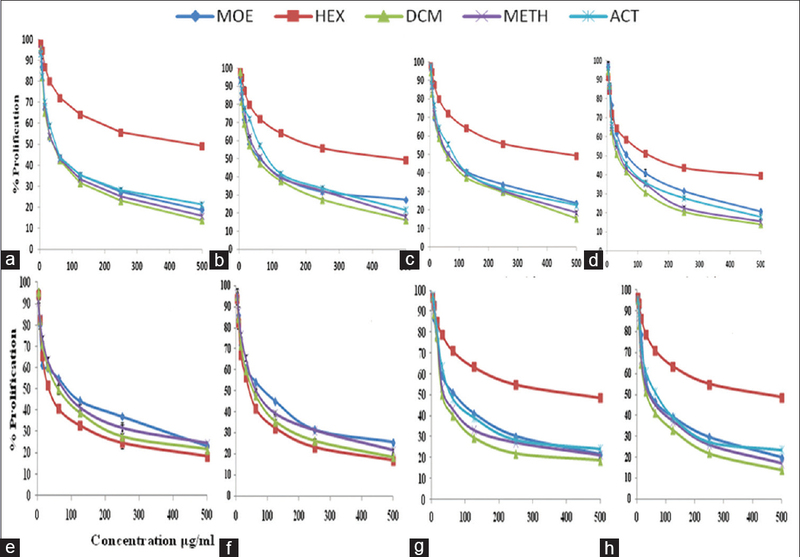 Results: Oral administration of DCM fraction at a dose of 40 mg/kg rendered prominent reduction of tumor regression parameters such as tumor weight, packed cell volume, tumor volume and viable tumor cell count as compared to the untreated mice of the EAC control group. The anticancer activity of DCM fraction may be due to the presence of large amount of bacoside A, B and cucurbitacins. The molecular docking studies of major metabolites with targeted proteins predicted the anticancer activity of DCM fraction which was in support of in vivo activity. Conclusion: The in vitro, in vivo, analytical and in silico studies on DCM fraction of Bacopa monieri has proved its great potential for development of anticancer phytopharmaceuticals. Abbreviations used: DBM: DCM fraction of Bacopa monnieri; DCM: Dichloromethane; EAC: Ehrlich ascites carcinoma; HCT: Hematocrit; HGB: Hemoglobin; HPTLC: High performance thin layer chromatography; ICH: International council for Harmonisation; LOD: Limit of detection; LOQ: Limit of quantification; LYM: Lymphocytes; MCH: Mean corpuscular hemoglobin; MCHC: Mean corpuscular haemoglobin concentration (MCHC); MCV: Mean corpuscular volume; MTT: 3-(4, 5-dimethylthiazol-2-yl)-2,5-diphenyltetrazolium bromide; PLT: Platelet; RBC: Red blood cell; RDW: Red blood cell distribution width; RSD: Relative standard deviation; WBC: White blood cells. A new HPTLC method has been developed and validated for the qualitative and quantitative analysis of bacoside A, B, cucurbitacin B, D, E and bittulinic acid in Bacopa monnieri extract. Enrichment of active anticancer metabolites was done by polarity based fractionations of hydroalcoholic extract of Bacopa. DCM fraction of a hydroalcoholic extract of Bacopa showed anticancer potential against human cancer cell line (IC50 41.0-60.0 μg/mL) and in EAC treated mice (at a dose of 40 mg/kg body weight). The anticancer activity of Bacopa may be due to the presence of bacosides and cucurbitacin and it was confirmed by in silico screening. Cancer is considered as one of the terrified diseases and it is a class of disorders characterized by uncontrolled cell proliferation and tissue invasion or metastasis of abnormal cell in the body. Cancer is the primary cause of death throughout the world and represents a foremost public health burden. It has been estimated that the overall figure of fresh instances of cancer will increase from 10 million in the year 2000 by almost 25% in every decade and may cross 24 million fresh cases in the year 2050; the aggregate figure of mortalities will ascent from 6 million in the year 2000–2010 million in 2020 to over 16 million in the year 2050. In less developed countries 17 million and in more developed countries 7 million of new cases of cancer will occur. Over the years, different approaches have been employed and are still in use, individually or in combination, in the treatment of cancer. These include chemotherapy, radiotherapy, surgery, and immunotherapy. Apart from surgery and radiation therapy physicians are usually preferred chemotherapy in most of the cases. Chemotherapeutic agents are cytotoxic and apart from affecting tumor cells, these active principles also deleteriously impact on rapidly proliferating normal cells, including those localized in the gastrointestinal tract, hair, and bone marrow, thus eliciting gastrointestinal side effects such as nausea and vomiting, alopecia, and myelosuppression. These antitumor therapies have also been associated with the development of secondary malignancy. All of the drawbacks presently associated with available chemotherapeutic agents are momentum for the quest for novel, more effective, and superior endured drugs. Natural products, especially the plant kingdom, offer an inexhaustible reservoir for investigation. With above view, numerous new strategies have been developed to control and treat cancer. A combination of phytochemicals with a chemotherapeutic agent could be efficacious while reducing toxicity. The plant Bacopa monnieri (BM) (L.), a traditional Ayurvedic plant, used for centuries as a memory enhancing, anti-inflammatory, antipyretic, sedative, antiepileptic agents, nervine tonic, anti-tumor agent, anti-Parkinson's agent, cardiotonic agent, protective effect, anti-Alzheimer's drug, hepatoprotective agent, antimicrobial agent, and adaptogenic agent. It is found in wetlands throughout the Indian subcontinent and locally known as Brahmi or Jalanimba. Antioxidant properties of Bacopa may postulate protection from free radical damage in cardiovascular disorder and certain types of cancer. The plant is reported to have cytotoxic potentials due to the presence of triterpenoid saponins such as bacoside A, bacoside B, brahmine, and herpestine. The traditional system of medicine treasures a host of medicinal formulations that have been shown to possess cytotoxic and cytostatic effects on tumor cell lines. However, there are few experimental studies, which validate the possible antitumor properties of Bacopa., However, no systematic reports are available on the antitumor activity of bioactive fraction along with their qualitative and quantitative analysis. Therefore, in response to the quest for search of novel anticancer agents, the aim of the present research work was to carry out the in vitro cytotoxic potential of dichloromethane (DCM) fraction and aqueous extracts of BM against breast cancer (MCF-7, MDA-MB 231), Colon cancer (HT-29, Caco2, Colo 320), Lung cancer (A549), and cervix cancer (HeLa, SiHa). Bioassay-guided fractionations from hydroalcoholic extract of BM through in vitro screening have been carried out to isolate the active fractions enriched with metabolites responsible for the anticancer activity. Apart from in vitro cell line activity, this study also correlates the antitumor activity in mice and their preassumed mechanism of action through in silico modeling. 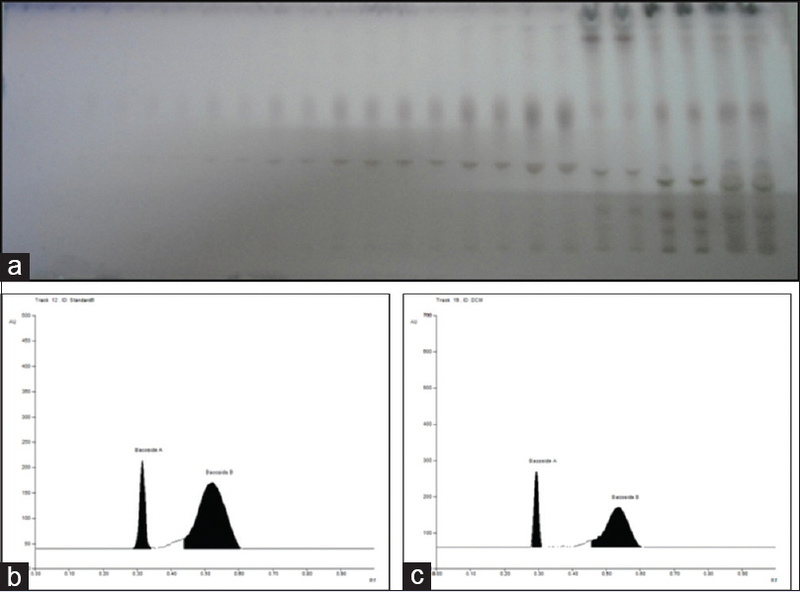 Later on, the fraction from the mother extract which showed highest cytotoxicity was further analyzed for its in vivo anticancer potential after their quality control for multiple marker-based analysis for its bacoside A, B, cucurbitacin B, D, E and bittulinic acid contents using newly developed and validated simultaneous High-performance thin-layer chromatography (HPTLC) methods. Apart from in vitro and in vivo anti-cancer activity, probable mechanism of DCM fractions has been predicted through in silico screening. RPMI-1640, phosphate buffered saline (PBS), Fetal bovine serum (Gibco, USA), Trypsin-EDTA, Trypan blue, penicillin-streptomycin and amphotericin and dimethyl sulfoxide (DMSO) were purchased molecular biology grade. Cucurbitacin B and 3-(4, 5-dimethylthiazol-2-yl)-2,5-diphenyltetrazolium bromide (MTT) and betulinic acid were procured from Sigma-Aldrich, USA, whereas cucurbitacin D, cucurbitacin E and bacoside A were obtained from Chromodex, USA. Bacoside B (Provided by Sami Labs, Bengaluru, India) was a gift sample. All the reference standard markers used had more than 98% purity. The plant materials were procured from local market of New Delhi, India, and the specimen (Ref. NISCAIR/RHMD/Consult/-2010-11/1563/161/27/10-10) authenticated by botanist Dr. H. B. Singh, Scientist F and Head Raw Material Herbarium and Museum, NISCAIR, New Delhi. The extraction was done by taking 500 g of powdered drug and extracting it using 70% ethanol as a solvent in soxhlet extractor on a water bath for 5 h. It was then filtered and vaporized to dryness under vacuum. Further, it was weighed to calculate percentage yields and extractive values. The hydroalcoholic extract of BM whole plant thus obtained was suspended in double distilled water and sonicated for 15 min at 45°C. Further, it was subjected to partitioning with different solvent, namely, hexane, DCM, and acetone. The extract left after partitioning was evaporated to dryness and excess was sonicated with acetone, methanol and water for 20 min each to prepare different fractions. All the fractions were vaporized to dryness under reduced pressure and yield percentage were calculated. The dried extract and fractions were further used for analysis and bioactivity. HPTLC fingerprints of mother extracts and its fractions such as hexane, DCM, acetone, methanol, and water fractions were carried out for their quality control and determination of number of compounds present in them. ICH guidelines and several reported laboratory methods were followed for quality control of herbal drugs and botanicals. The dried mother extract and fractions (100 mg each) of BM were reconstituted using HPLC grade methanol in a 10 mL volumetric flask to get 10 mg/mL solution. These were sonicated and before being used for HPTLC analysis, 0.22 μM syringe filter was used for filtration. In triplicate (8.0 μL each), samples were applied, and the width of the track was 4.0 mm on precoated silica gel 60 F254 plates (E. Merck, 0.20 mm thickness), using Linomat V (HPTLC sample applicator). Linear ascending development was performed in 10 cm × 20 cm twin trough-glass chamber (Camag, Switzerland). The chamber saturation time for the solvent system [Table 1] was optimized and it was found 30 min at 25°C and 60% of relative humidity. The chromatogram was developed up to 85% of total TLC plate height. Developed chromatograms were scanned at 254 nm for DCM extract without derivatization, whereas at 520 nm for other extracts after derivatization with anisaldehyde sulfuric acid [Table 1]. The wavelengths for fingerprinting were selected by multi-wavelength scanning showing the highest number of peaks. The cytotoxicity assay of mother extract and its hexane, DCM, acetone, methanol, and water fractions were carried out to find out a best active fraction. 500 mg of each extract was dissolved in 10 mL of DMSO and then passed through a 0.45 μ membrane filter and stored at 4°C until used. The 50 mg/mL solutions of every extract/fractions as prepared above were diluted fifty times using RPMI-1640 media (1 mL to 50 mL) to get a concentration of 1 mg/mL of every extract/fractions. It was passed through 0.22 μ membrane filter before using for in vitro activity on different cell lines. Similarly, DMSO control was also prepared and used in every cell line. where Ac and As are the absorbances of the control and sample respectively. All assays were executed in triplicate and reiterated, at least, three times. For quantitative estimation of bacosides, a new, simple, precise, and economic HPTLC method has been developed. ICH guidelines and several reported laboratory methods were emanated for validation of developed HPTLC method. 500 μg/mL of stock solution of bacoside A, B was made in HPLC grade methanol. A concentration of 250.0 μg/mL of each standard was obtained by mixing an equal volume of each stock solution (bacoside A, B). These mixed stock solutions were applied in triplicate in different volumes (0.1–10 μL) on HPTLC plate for the development of simultaneous HPTLC method and calibration plot. Ethyl acetate:methanol:water (70:20:10, v/v/v) was used as a solvent system for simultaneous elution of bacoside A and B. Developed chromatograms were derivatized by spraying with anisaldehyde sulfuric acid and then scanned at 450 nm for both qualitative and quantitative analysis of bacosides. A linear least square regressions equation were obtained by plotting a graph of peak area versus drug concentration and concentration range showing best regressions were considered for linearity and using this plot, concentration of unknown sample were determined. Validation of developed HPTLC method was followed ICH guidelines for calibration, linearity, robustness, precision, specificity, accuracy, limit of detection (LOD), and limit of quantification (LOQ), similar to the other methods reported from the laboratory. The LOD was expressed as (LOD = 3.3 σ/slope), whereas LOQ was expressed as (LOQ = 10 σ/slope of calibration curve). The precision of an analytical procedure was obtained from several sampling of the homogeneous sample under the similar conditions. The exactness of the proposed methods was obtained by repeatability and intermediate precision. Between day and intra-day, precisions were carried out by preparing and applying three separate concentration of standard (in triplicate) around the same time and in three separate days, individually. The inter-analyst precisions were carried out by repeating same procedure using a different system of the same make and by a different analyst. Precision studies were done at three concentration levels. The method of precisions was determined and reported in terms of % reflex sympathetic dystrophy (RSD). Robustness of the methods was carried out by introducing small changes in the different method parameters such as compositions of mobile phase and detection wavelength. The effect on the results was studied as % RSD. The specificity of the methods was determined by analyzing standard drug and sample. The detection of a spot for bacoside A and B in mother extract and DCM fraction was confirmed by matching Rf and spectra of the spot with that of standards. The purity of peak was evaluated by looking at the spectra at three different levels, i.e., peak start, peak apex and peak end of the spot. The accuracy of an analytical technique is the closeness of test outcomes got by that method to the hypothetical worth. Accuracy may often be expressed as percent recovery by the assay of added known amounts of analyte. The preanalyzed specimens were spiked with standard with four different concentration levels separately, i.e., 0, 50, 100, and 150% and the mixtures were reanalyzed by the developed methods. The previously developed methods for simultaneous estimation of cucurbitacin B, D, E, and betulinic acid  and newly developed method for bacoside A and B were used for quantitative determination of metabolite content. The samples were applied in triplicate on HPTLC plates with each standard separately and the contents of metabolites were analyzed, using regression equations obtained from calibration plots, and yield expressed as %w/w. The in vivo study was performed to carry out the anticancer activity of DCM fraction (in 1% carboxy methyl cellulose [CMC]) of hydroalcoholic extract of BM after oral administration to female Balb/c mice (25–30 g) as per the standard protocol. The dose of DCM fraction was decided as per its extractive value equivalent to the dose of the drug (4 g/daily). The activity was carried out under strict guiding principles of institutional animal ethics committee (CPCSEA) as per the approved protocol (project no 915/22.10.2012). Twenty-four female Balb/c mice were obtained from central animal house facility of University and apportioned into four groups, and each group had six animals each. Group I, served as control (nontumor mice, untreated), receiving 1% CMC (0.2 mL oral, once daily for 40 days). Other groups received Ehrlich ascites carcinoma (EAC) cells (2 × 106 cells/mouse, intraperitoneally (i.p. ), which was obtained generously from Cell Culture Laboratory of Dr. Dwarka Nath, INMAS, New Delhi. Group II served as toxic control (tumor induced, untreated mice), whereas Group III received a suspension of DCM fraction (40 mg/kg body weight, orally), once daily. However, Group IV received standard 5-fluorouracil (5-FU) (20 mg/kg body weight, i.p.) once daily for 10 d, after 24 h of EAC transplantation. The tumor regression parameters (packed cell volume [PCV], tumor volume, tumor weight, viable, and nonviable cell count) were analyzed after oral administration of the last dose. The mice from the individual group were kept fasting for 18 h and blood samples were collected in ethylenediamine tetra acetic-coated vials the following anesthesia with ketamine-xylazine by cardiac puncture for the estimation of hematological toxicity. The animals were then sacrificed by cervical dislocation for the study of antitumor activity. An automated hematologic analyzer (MS9 Differential Cell Counter 3 Part, HD Consortium, India) were used hematologic examination. The hematological parameters such as white blood cells (WBC), total red blood cell (RBC), platelet (PLT), lymphocytes (LYM), hemoglobin (HGB), hematocrit (HCT), mean corpuscular volume, mean corpuscular hemoglobin (MCH), red blood cell distribution width (RDW) MCH concentration (MCHC), and MID cells (less frequently occurring and rate cells correlating to monocytes, eosinophils, basophils, etc.) were analyzed using a blood automatic analyzer. 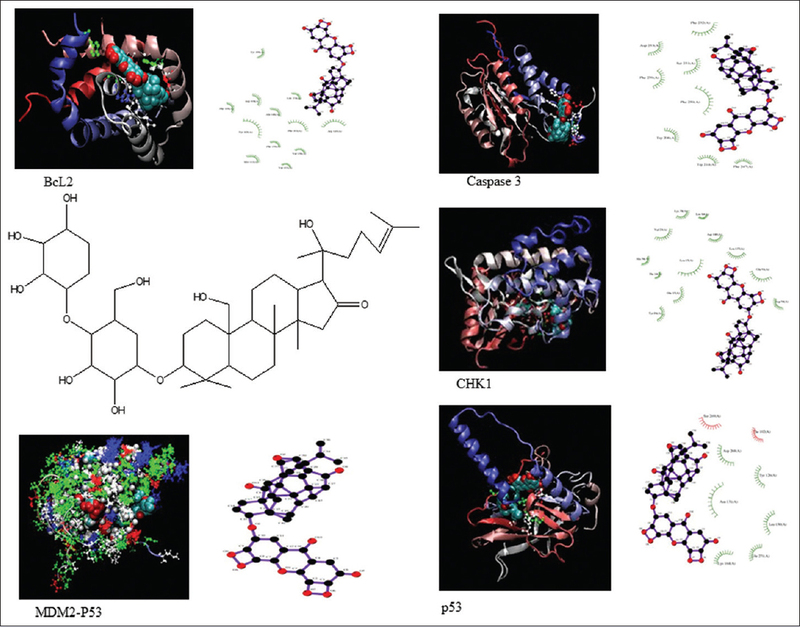 To have a better understanding of the mode of interactions of the phytochemical compounds present in DCM fraction, docking analysis was accomplished using the MOPAC 6 software package (Stewart Computational Chemistry, Colorado Springs, CO, USA). Different proteins were assumed that they might have interacted with targeted molecules (bacoside, betulinic acid, and cucurbitacin E). From the literature review, eight different proteins such as MDM2-p53 auto-regulatory loop, Caspase-3, p53, Bcl2 isoforms, checkpoint kinase-1, and palmitoyl protein thioesterase1 were selected for docking analysis. Calculations of docking were performed on different protein model. Solvation parameters, kollman united atom type charges, and Essential hydrogen atoms were added with the aid of AutoDock tools. Autogrid program was used for generation of affinity (grid) maps of × Š grid points and 0.375 Š spacing. The van der Waals and the electrostatic terms were calculated by auto Dock parameter set and distance-dependent dielectric functions, respectively. Simulations of docking were executed using the Lamarckian genetic algorithm and the Solis and Wets local search method. A random selection has been done for initial position, orientation, and torsions of the ligand molecules. During docking, all rotatable torsions were released. Individual docking experiment was originated from 2 different runs that were set to terminate after a maximum of 250,000 energy assessments. The population extent was set to 150. A translational step of 0.2 Š, and quaternion and torsion steps of 5 were applied during the search. The structure of molecules in mol format was drawn in ChemDraw Ultra 7.0.1 (CambridgeSoft Corporation, Cambridge, USA) and converted to input ligand format (pdb) for docking by OpenBabel version 2.3.2 Open Babel: An open chemical toolbox (Journal of Cheminformatics 2011, 3:33). Values were expressed as mean ± standard deviation. One-way analysis of variance followed by Dunnet's test for comparison analysis (GraphPad, San Diego, CA, USA) was used for the assessment of statistical significance level. All the treatment groups were paralleled with the toxic control group. P < 0.05 was considered statistically significant. The plant material was extracted using ethanol (70% v/v) by maceration and soxhlet extraction after optimization. The hot extraction was selected for study due to its high yields and called as mother extract (18.5%). 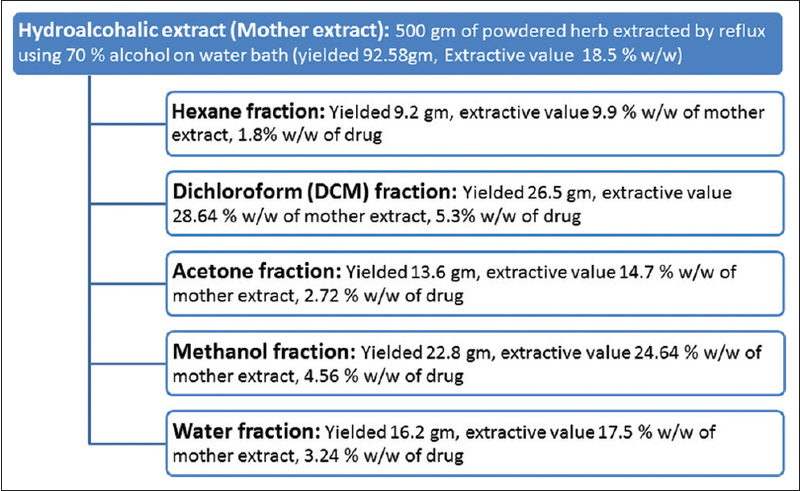 Mother extract was further fractionated using hexane (9.9% w/w), DCM (28.6% w/w), acetone (14.7% w/w), methanol (24.6% w/w), and water (17.5% w/w). However, 4.2 g of hydroalcoholic extract (4.54% w/w) of the drug was lossed during the processing [Figure 1]. The HPTLC fingerprinting of mother extract, and different fractions were developed on silica gel. The DCM fraction showed maximum number of ultravilot active compounds and thus detected at 254 nm, whereas other fractions and mother extract were detected at 520 nm after visualization using anisaldehyde sulfuric acid reagents [Figure 2] and [Table 1] showed different solvent system used for fingerprinting of extract/fractions with a number of spots present in them with their respective Rf values. The cytotoxicity of hydroalcoholic extracts and its fractions of BM on certain cancer cell lines were determined by MTT assay. The results of cytotoxicity assay of mother extract with hexane, DCM, acetone, methanol and water fractions are summarized in [Table 2]. DCM fraction (IC50 ranged from 41 to 60 μg/mL at 72 h) showed best cytotoxic activities for all cancer cell lines as compared to others. The best cytotoxic activity of DCM fraction from Bacopa monnieri (DBM) may be attributed due to the existence or synergistic activities of phytochemical components including sterol, triterpenes and polyphenols.,, However, betulinic acid may have been attributed this activity since DBM is rich in same as proved by our analytical studies. 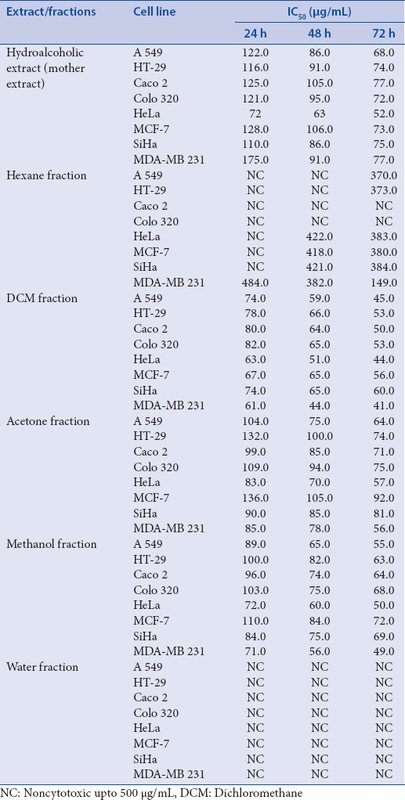 MTT assay results of all four cell lines proved that cytotoxicity was highest in DCM followed by Methanol fraction and mother extract at 72 h as shown in [Figure 3], similar to results of 24 h and 48 h as shown in [Table 2]. The water fraction did not produce any cytotoxicity up to 500 μg, whereas hexane fraction showing only poor cytotoxicity. Ethyl acetate:methanol:water (70:20:10, v/v/v) as the solvent system was developed for separation and quantification of bacoside A, B which gave good separation of components. The plate was scanned at 450 nm wavelengths after derivatization with anisaldehyde sulfuric acid, which produces exceptionally well-characterized peaks of bacoside A, B at Rf values 0.32 ± 0.01, 0.52 ± 0.02, respectively [Figure 4]. Validated HPTLC method was used for the analysis of bacoside A and B in DCM fraction. The peak areas of samples were used for quantitative analysis of bacoside A and B by exploiting regression equation obtained from the linearity plot. Content obtained for different markers are reported in [Table 3]. The newly developed methods for simultaneous estimation of bacoside A, B were found linear in the wide range of concentration with good regression coefficient (>0.99). The linearity data of all the biomarkers developed such as range linearity, regression equation, regression coefficient, slope, intercept, LOD, and LOQ are shown in [Table 3]. Precisions of developed method such as intra-day and inter-day precision were determined and reported in terms of % RSD at three different concentration levels. The percentage RSD of inter-day precision and intra-day precision were found in the range of 1.74–2.01 for all compounds as reported in [Table 4]. The low values of % RSD obtained after incorporating slight but thoughtful changes in the composition of the solvent system and wavelength indicated the robustness of the methods [Table 5]a and [Table 5]b at 3 different concentration levels. The specificity of the methods was determined by analyzing standard drugs and samples. The detection of a spot for bacoside A, B in DCM fraction was confirmed by matching Rf and spectra of the spot with that standard. The peak purity was evaluated by evaluating the spectra at three different levels i.e., peak start, peak apex, peak end positions of the spot. The LOD and LOQ of different markers were computed as per reported standard protocol  and are reported in [Table 3]. The LOD of markers are in the range of 33.0–66.5 ng, indicating the good sensitivity of methods for simultaneous quantification of compounds. Accuracy in terms of recovery of developed method was calculated by standard addition method by spiking 0%, 50%, and 100%, 150% of analyte in analyzed samples, which showed better recovery of all biomarkers used and are in the range of 99%–101.4% [Table 6]. The peak areas of triplicate samples were evaluated by regression equation obtained from the linearity plot. Content obtained for different phytoconstituents is shown in [Table 7]. Cucurbitacin D was found absent whereas bacoside A content was maximum (3.89 ± 0.016) in DBM. DBM showed a significant effect on tumor regression parameters of EAC cell-bearing mice. The DCM fraction significantly (P < 0.01) reduces the tumor volume, % PCV, tumor weight at a dose 40 mg/kg body weight in compare to EAC control groups as shown in [Figure 5]. The results were almost comparable to that of 5-FU, a standard drug. 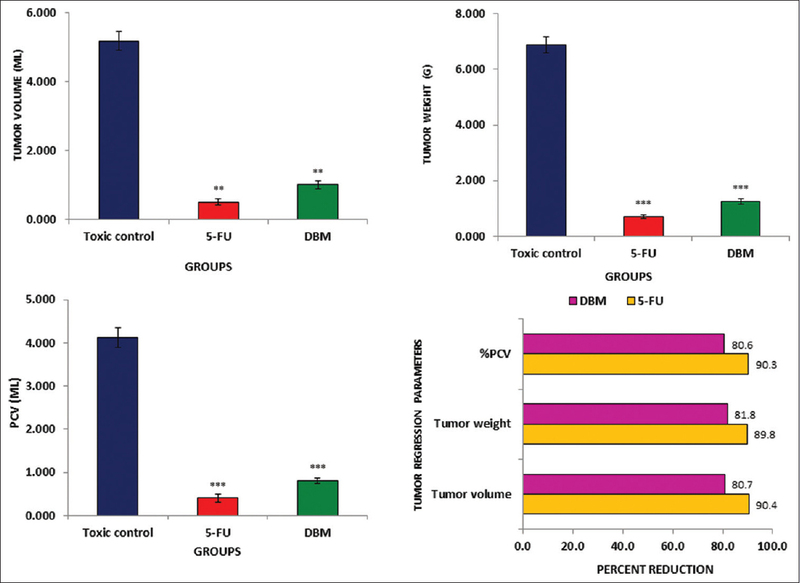 It was observed that there was a significant decrease in no of tumor cells on treatment with DCM fraction and 5-FU in tumor-bearing mice as compared to EAC control. Similarly, percentage viable cells were decreased significantly in treatment groups as compared to untreated EAC control [Table 8]. Hematological parameters of EAC tumor-bearing and treatment group mice were studied on the 14th day, which showed significant changes in the number of WBCs only and that was reversed in treated groups as compared to untreated EAC control. Other parameters such as Hb, RBC, LYMs, HCT, RDW, PLT, etc., were found to near normal and did not produce any significant alteration [Table 9]. The reliable principles for arbitrating the healthier value of any anticancer drug are the loss of leukemic cells from the blood, reduction of solid tumor volume, and prolongation of life span. Tumor grafting includes a local inflammatory reaction, with increasing vascular penetrability resulting in an intense ascetic fluid accumulation. Our results showed a significant reversal of tumor regression parameters complemented by a reduction in WBC count in DBM treated mice. The DCM/enriched fraction also constrained the accumulation of ascetic fluid in the peritoneal cavity of the tumor-bearing animals. Above results clearly revealed the antitumor effect of BM on EAC tumor cells. Considering results obtained from in vitro and in vivo study, it was thought worthy to perform molecular docking studies which correlate in silico results with in vivo and in vitro results. 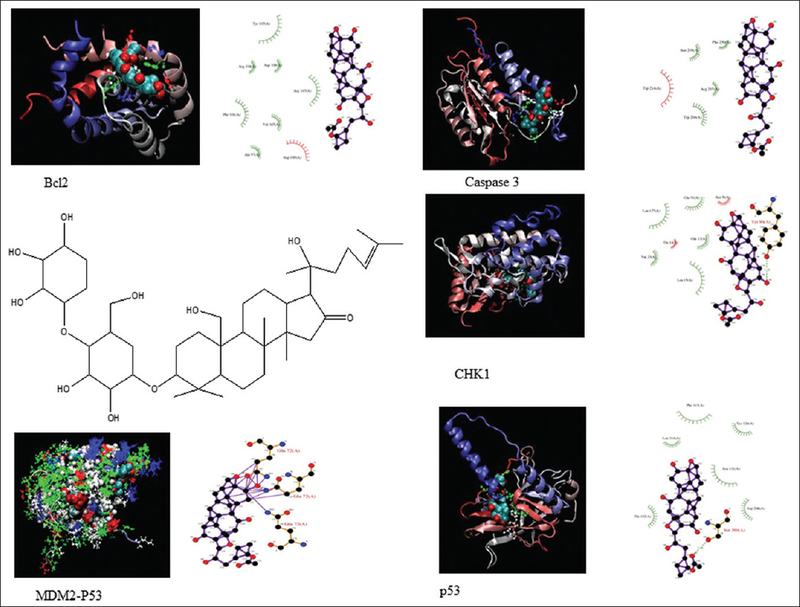 Docking studies are used to predict a ligand-receptor interaction and also to rank the compounds based on the binding energies or fitness score. In the present study, docking of tested compounds with targeted proteins was performed, and the corresponding fitness score was also determined as shown in [Table 10]. The Estimated free energies for interaction followed the order of the best fitness score. Highest fitness scored compound was further subjected to compare its interaction surface and total intermolecular energy with targeted molecules and proteins separately. Protein-ligand interaction in docking studies resulted with lowest free energy and highest frequency. Estimated free energy of ligand-protein interaction was found < -5.2 for MDM2-p53 auto-regulatory loop, Caspase-3, p53, Bcl2 alpha isoform, checkpoint kinase-1, palmitoyl protein thioesterase 1 and this interaction indicating that expression of these proteins might be changed after oral administration of DCM fraction. Interaction of protein and ligand were shown in [Figure 6], [Figure 7], [Figure 8]. Some previous study suggested that anti-tumor activity of Bacopa due to bacosides,, cucurbitacins,, and also betulinic acid. This docking study presented probable mechanism of action of anti-tumor activity of DBM. Further, a molecular-based study is needed for confirmation of this above-proposed mechanism. Through the above results, it can be concluded that mother extract and all other fractions of BM show cytotoxic potential, yet it was DCM fraction which expressed most significant cytotoxic strength. DCM fractions showed therapeutic efficacy against EAC tumor-bearing mice while giving protection against malignancy incited modified physiological conditions. The developed and validated quantification method of bacoside A and B, cuccurbitacin B, E and betulinic acid can be utilized for quality control and for other drugs containing them as an ingredient. From the above findings, it could be inferred that DCM fraction of BM displayed powerful anticancer action as exhibited from in vitro cytotoxicity such as Colon, Lung, Cervix, and Breast cell lines. 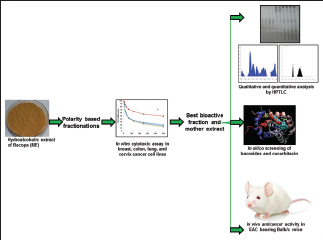 In addition, EAC tumor model in mice also showed significant reversal of tumor regression parameters which was again supported by in silico study. For financial support, the authors would like to thank CCRUM, (Ministry of AYUSH) (File No.3-6/2009-CCRUM/EMR); Dr. Dwarkanth of INMAS, New Delhi, is acknowledged for EAC cells. For financial support, the authors would like to thank CCRUM, (Ministry of AYUSH) (File No.3-6/2009-CCRUM/EMR). Park SU. Anticancer compounds from plants. EXCLI J 2012;11:386-9. Samudrala PK, Augustine BB, Kasala ER, Bodduluru LN, Barua C, Lahkar M. Evaluation of antitumor activity and antioxidant status of Alternanthera brasiliana against Ehrlich ascites carcinoma in Swiss albino mice. Pharmacognosy Res 2015;7:66-73. Pandey G, Madhuri S. Some medicinal plants as natural anticancer agents. Pharmacogn Rev 2009;3:259. Shikha S, Nidhi M, Upama M. Bacopa monniera – A future perspective. Int J Pharm Sci Drug Res 2009;1:154-7. Jash R, Chowdary KA. Ethanolic extracts of Alstonia scholaris and Bacopa monniera possess neuroleptic activity due to anti-dopaminergic effect. Pharmacognosy Res 2014;6:46-51. Mallick MN, Akhtar MS, Najm MZ, Tamboli ET, Ahmad S, Husain SA. Evaluation of anticancer potential of Bacopa monnieri L. against MCF-7 and MDA-MB 231 cell line. J Pharm Bioallied Sci 2015;7:325-8. Mohan N, Jassal PS, Kumar V, Singh RP. Comparative in vitro and in vivo study of antioxidants and phytochemical content in Bacopa monnieri. Recent Res Sci Technol 2011;3:78-83. Ghosh T, Maity TK, Singh J. Evaluation of antitumor activity of stigmasterol, a constituent isolated from Bacopa monnieri Linn aerial parts against Ehrlich ascites carcinoma in mice. Orient Pharm Exp Med 2011;11:41-9. Peng L, Zhou Y, Kong de Y, Zhang WD. Antitumor activities of dammarane triterpene saponins from Bacopa monniera. Phytother Res 2010;24:864-8. Suresh HM, Shivakumar B, Hemalatha K, Heroor SS, Hugar DS, Rao KR. In vitro antiproliferativeactivity of Annona reticulata roots on human cancer cell lines. Pharmacognosy Res 2011;3:9-12. Parveen R, Ahmad FJ, Iqbal Z, Samim M, Ahmad S. Solid lipid nanoparticles of anticancer drug andrographolide: formulation, in vitro and in vivo studies. Drug Dev Ind Pharm 2014;40:1206-12. 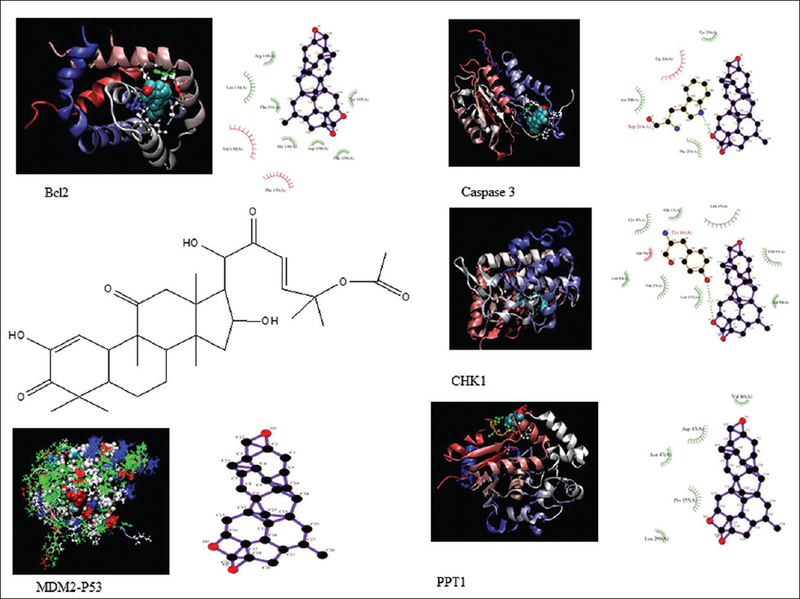 Qin JJ, Nag S, Voruganti S, Wang W, Zhang R. Natural product MDM2 inhibitors: anticancer activity and mechanisms of action. Curr Med Chem 2012;19:5705-25. Ye B, Xie Y, Qin ZH, Wu JC, Han R, He JK. Anti-tumor activity of CrTX in human lung adenocarcinoma cell line A549. Acta Pharmacol Sin 2011;32:1397-401. Singh N, Nigam M, Ranjan V, Sharma R, Balapure AK, Rath SK. Caspase mediated enhanced apoptotic action of cyclophosphamide- and resveratrol-treated MCF-7 cells. J Pharmacol Sci 2009;109:473-85. Xiao Z, Xue J, Sowin TJ, Zhang H. Differential roles of checkpoint kinase 1, checkpoint kinase 2, and mitogen-activated protein kinase-activated protein kinase 2 in mediating DNA damage-induced cell cycle arrest: implications for cancer therapy. Mol Cancer Ther 2006;5:1935-43. Tardy C, Sabourdy F, Garcia V, Jalanko A, Therville N, Levade T, et al. Palmitoyl protein thioesterase 1 modulates tumor necrosis factor alpha-induced apoptosis. Biochim Biophys Acta 2009;1793:1250-8. Solis FJ, Wets RJ. Minimization by random search techniques. Math Oper Res 1981;6:19-30. Kalachaveedu M, Papacchan S, Sanyal S, Koshy T, Telapolu S. Isolation and evaluation of cytogenetic effect of Brahmi saponins on cultured human lymphocytes exposed in vitro. Nat Prod Res 2015;29:1118-21. Ku JM, Kim SR, Hong SH, Choi HS, Seo HS, Shin YC, et al. Cucurbitacin D induces cell cycle arrest and apoptosis by inhibiting STAT3 and NF-κB signaling in doxorubicin-resistant human breast carcinoma (MCF7/ADR) cells. Mol Cell Biochem 2015;409:33-43. Ayyad SE, Abdel-Lateff A, Basaif SA, Shier T. Cucurbitacins-type triterpene with potent activity on mouse embryonic fibroblast from Cucumis prophetarum, cucurbitaceae. Pharmacognosy Res 2011;3:189-93. Tiwari R, Puthli A, Balakrishnan S, Sapra BK, Mishra KP. Betulinic acid-induced cytotoxicity in human breast tumor cell lines MCF-7 and T47D and its modification by tocopherol. Cancer Invest 2014;32:402-8.